Anna was born May 2002. She was healthy and showed no signs of liver disease. By five months of age she started developing symptoms of itching, yellow eyes, light colored stools and unexplained fevers. We went to a GI Specialist at Cooks Children's Hospital in Ft Worth. Many tests were run and while it was clear the liver was having problems nothing was able to be diagnosed. We were referred to a second specialist at Dallas Childrens Hospital. He told us he thought it was PFIC II but that they could not confirm it. After much internet research I found that there was a new test that could diagnose her, available only at Kings College Hospital in London. After some discussion with our doctors, in May 2003 my husband flew Anna's biopsy slides to London to test for PFIC II. In about a week it was confirmed that she had PFIC II. Now diagnosed, the decision was made to go to Mt Sinai Hospital in NY and try a new procedure. This surgery would internally re-route part of the small intestine to try get some of the bile acid off the liver. Our hope is that it would slow down or stop the disease and relieve the itching/pruritus. The surgery was done in July 2003 . That surgery was one of the first to try to treat her disease. PFIC II is very rare and other than transplant not a lot has been tried in the way of treatment. The surgery was not as successful as we hoped and by September it was clear we were going to need a liver transplant. The pruritus was extremely disruptive and quality of life was now becoming an issue. In September 2003, we went to Texas Children's Hospital in Houston and got on the waiting list for a liver transplant. 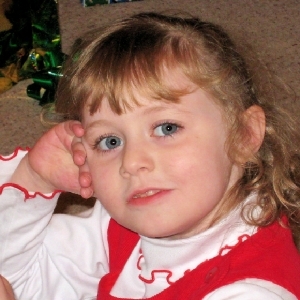 In December our prayers were answered and in December 2003 at 17 months old, Anna received her liver transplant. Five days later Anna was released from the hospital. She no longer itched, and her scratch marks were all healing. She was up dancing and running around. It was incredible! We stayed in Houston another month to adjust medication doses and do blood work. The first of February,we returned home. In December 2006 we celebrated Anna's three year transplant anniversary with a party and by giving out organ donor cards and green ribbon awareness pins. I am thankful for all the people we met along the way and for the encouragement and support they provided. PFIC II is a genetic disease that neither of our family's had a history of. It took a lot of of time and a lot help to get through the maze of insurance, medical research, and doctors. We could not have done it without all the people who went out of their way to help us. Anna will be five years old in May 2007. She still goes in for regular lab work but, overall she is doing extremely well. Our only problem now is trying to keep up with her.